I think we were all probably expecting this. I just walked past the Mandarin Oriental the other day on my way to the new Apple store (here) and it looks pretty close, but definitely not ready for a July opening like it was originally scheduled. Part of it was probably due to the four alarm fire that broke out a couple months ago (here). So, they've rescheduled the grand opening for October. That's three months later than the originally-planned opening date. The hotel suffered a setback from its original July opening when a four-alarm fire broke out on the fourth-floor's fitness/spa area in March. Construction is continuing. The Back Bay project, headed by Suffolk Construction, includes a 148-guest room hotel, 50 luxury condominiums and 25 apartments, mixed retail and other amenities, including a 16,000-square-foot spa. Frank Nicholson, of Massachusetts, is the interior designer. Is it just me or does the artist rendering from over a year ago look nicer than the real thing? Click (here) for the blurb in the BBJ. 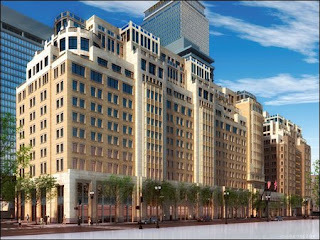 1 Response to "Mandarin Oriental Opening Postponed Til October"
Uh, renderings always look better than the real thing. I'm amazed how little changed from the rendering to construction -- the BRA usually lets developers make zillions of changes that never get any public review. The Mandarin is still one of the nicest new buildings in Boston in a very, very long time.